For energy healers, leaders, and any woman committed to making incredible impact based on a strong foundational practice. Especially helpful for women who are transcending abuse, trauma, or heavy blockages. ​a wise face for life's every stage. As a priestess and mentor, I help spiritual women heal from abuse and trauma, using mantras, sacred crystals, and shamanic rituals so we can walk together in wealth, power, and purpose. Come enjoy exclusive spiritual mentoring and mysticism in luxurious Kiawah, South Carolina. This powerful oil contains amber, sambrani, frankincense, rose, rutilated quartz, and more to help you evoke mystic dreams full of guidance. Wear it on your body and/or diffuse it using an oil burner to create your own mystic temple in the comfort of home. Large 50 ml bottle for extended dreamwork over many weeks. My signature Elevation Oil paired with my Luxe Rose Sugar Scrub. Both are composed of a unique blend of oils for frequency elevation... with an even sweeter formulation. ​Need a boost to your power of attraction? Visit my space at Taylor's Collective to shop for specially prepared artisanal oils, crystal empowerments, and handmade dream journals. Handmade dream journal featuring my poetry and personal family ephemera from the 1930's through 80's. A unique tome to store your dreams and sacred thoughts. Hetep, I'm Sekayi-- writer, priestess, and lover of mysticism. I offer specialized service to women who already have a great deal of spiritual understanding. The women who patronize my shop or attend my gatherings walk a very specific path of self-love, intuitional mysticism, and ancestral calling. She knows much, yet is open to further learning. My task is to hold the space, provide the mantras, and make the offerings which I have been taught by my spiritual guides. These offerings are not simply to some abstract amorphous deity, but to the deity which resides in every woman. I serve the sacred feminine and walk as a daughter, a sister... planting and watering seeds. Feel free to explore this site to learn more about this path of sacred feminine gnosis. Check this page often for announcements, upcoming events, classes and new empowerments. "The way is through Love..."
Exalted Mystic Union is about helping women heal, cutting karmic cords in order to allow for direct perception of highest guidance and empowered purpose. If you feel called, join our circle by taking a course. ​​To shop for high-vibrational crystals or Dream Journals, visit my Etsy shop. 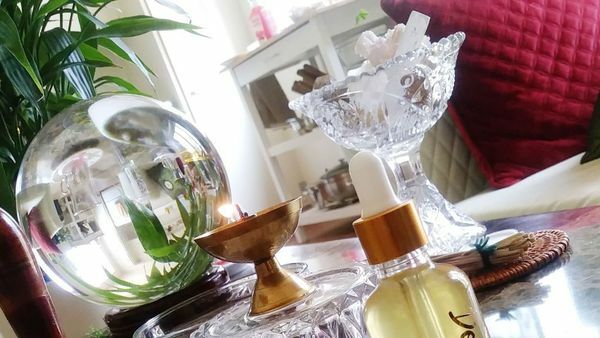 I work with divine inspiration to create crystal empowerments, dream journals and artisanal oils which I hope you fall in love with and benefit from.